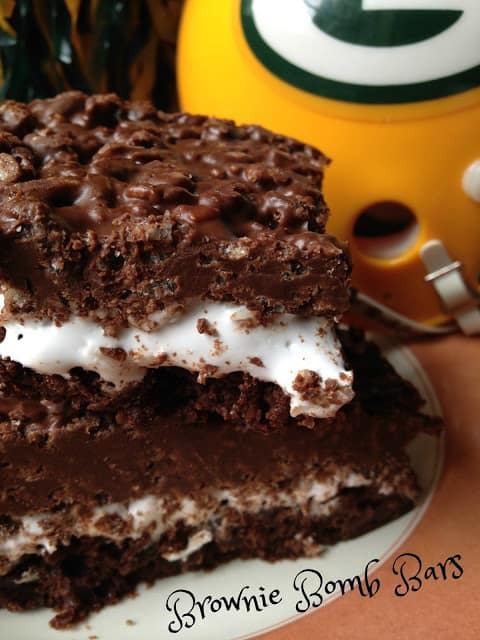 Brownie Bomb Bars are perfect for football season, my favorite time of year. Football season here in Wisconsin is a sure sign that fall has officially arrived. Football season also signals that comfort food is back on the menu and “grilling time” is reserved for brats on Sunday before the big game. The hot, humid days of summer are replaced with cool, crisp days. Lazy days of summer are gone and school is back in session. I can hear all you Mom’s cheering, Yippee!! I can even describe how delicious and decadent these bars really are. They are totally unbelievably good. They are definitely the bomb! One bite of these bars and you will be in brownie bar heaven. 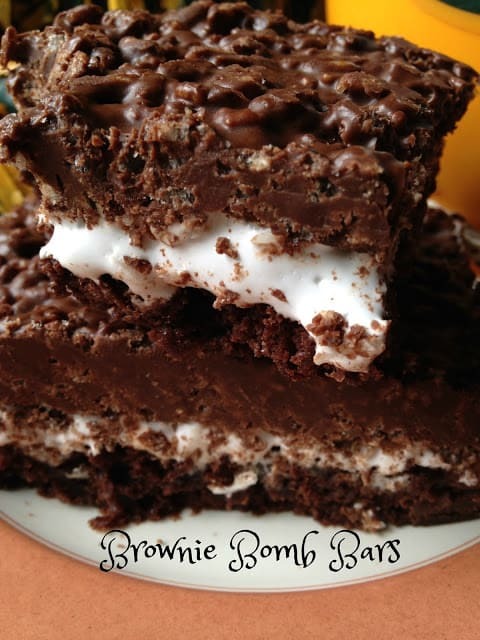 Brownie Bomb Bars have three layers of delicious goodness. The bottom layer is a chocolate chip brownie, middle layer is marshmallow creme, sprinkled with coconut and the top layer is melted milk chocolate chips, peanut butter and cocoa krispies cereal….told you they were good! You will definitely score a touchdown and a two point conversion with family and friends when you serve these bars. This Weeks Event is Easy Football Food Ideas for Game Day. Football Season has arrived and it’s time to get out your pom poms and cheer on your favorite team! Go Pack Go! Heat oven to 325º Lightly grease 13 x 9-inch baking dish/pan. In a medium bowl, stir together brownie mix, egg, oil and water until fully blended. Spread brownie batter into prepared dish/pan. Bake for 35 to 45 minutes. Do not over bake. 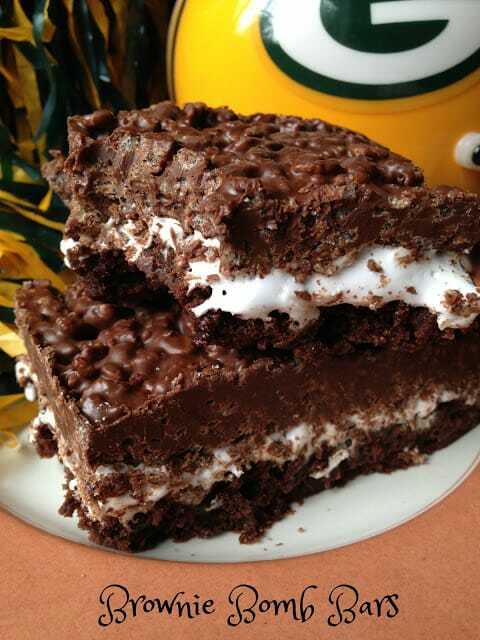 When cool, spread jet-puffed marshmallow creme on brownies. Sprinkle coconut over marshmallow creme. Place chocolate chips and peanut butter in a medium size microwave safe bowl. Microwave until well blended and smooth, stopping at 1 minute intervals to stir. Once melted and smooth, stir in cocoa krispies cereal. Spread evenly over marshmallow/coconut layer. Cover and chill for 2 hours before cutting into bars.